Who were the earliest inhabitants of the British Isles? The answer is not entirely clear, for some of them arrived in Britain in the dim recesses before recorded time. Among them were the Iberians from present day Spain and Portugal, who brought late Stone Age weapons to Britain’s shores. The last and by far the most important, of the early conquerors were the Celts, a people from southern Europe who had gradually migrated west. Between 800-600 BC, two groups of Celts invaded the British Isles. One group who called themselves Brythons (now spelled “Britons”), settled on the largest island, Britain. The other known as Gaels, settled on the second largest island, known to us as Ireland. Gaels and Britons spoke different but related languages of the Celtic family. Celtic languages had nothing in common with the Germanic ones later associated with the Anglo and Saxons. The Celts were farmers and hunters. They organized themselves into tightly knit clans, each with a fearsome loyalty to its chieftain. When these clans fell into argument with one another, they often looked to a class of priests known as Druids to settle their disputes. Druids presided over religious rituals and also memorized and recited long heroic poems that preserved the people’s myths about the past. Some of the poems may have included fables about such leader as Old King Cole of the nursery rhyme and King Lear of Shakespeare’s play. The next conquerors of Britain were the far more sophisticated Romans. In 55 BC and again the next year, Julius Caesar made hasty invasions. Although he barely penetrated the island, he quickly declared it conquered and returned to what is now known as France to work on his memoirs. The true conquest of Britain occurred nearly 100 years later during the reign of the Roman emperor Claudius. Disciplined Roman legions spread out over the island, establishing camps, which soon grew into towns. The Romans transplanted many comforts of urban, Mediterranean culture to the distant, rain drenched north. In perhaps their greatest contribution, they constructed a system of well paved roads, through the woodland wilderness, highways that continued to serve the island for centuries. The Roman rule of Britain lasted for more than 300 years. It ended only when northern European tribes invaded Italy and increased pressure on Rome itself. The last Roman legions departed from Britain to defend Rome in 407 AD. By that time, some of their towns were already falling to ruin, and the Britons faced a new set of invaders. As we have seen, the next invaders were the Anglo-Saxons. Who were these ancient people? Lacking authentic first had accounts from the period, historians simply have to guess. 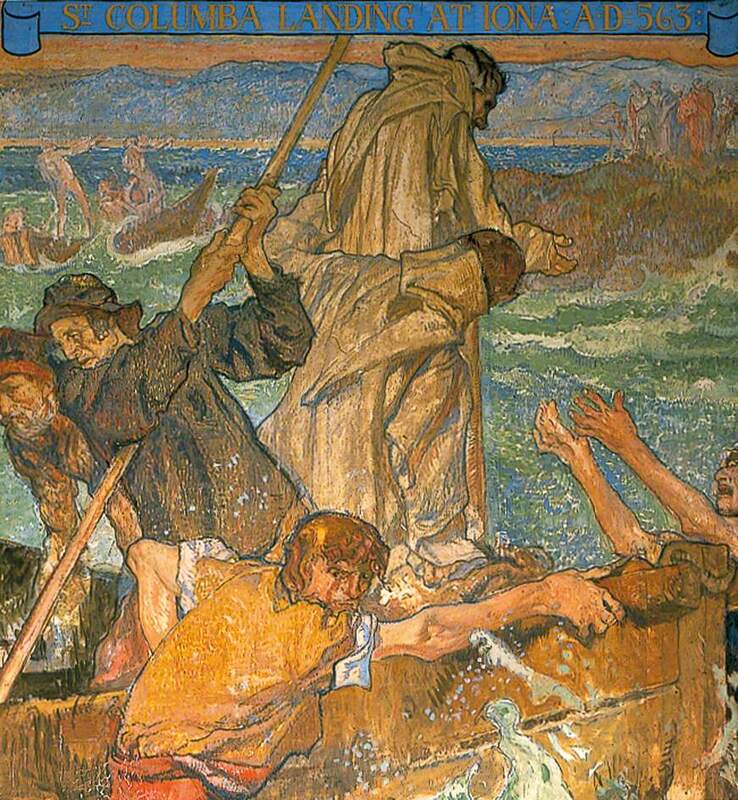 Some Anglo-Saxons appear to have been deep sea fisherman, already accustomed to marauding the coasts along the Baltic Sea. Others seem to have been farmers, perhaps seeking soil richer than the sandy or marshy land at home. Ferocious as the Angles and Saxons may have been, they did not perform their piracy merely for plunder- at least not for long. They sought and won territory, apparently by rowing their shallow boats up river into the British heartland and then building camps and waging war on the Britons. Gradually, the newcomers gained the upper hand over the island’s settlers and took over more and more (and more) of what today is England. The first Anglos, Saxons, and Jutes transferred to England their highly organized tribal units. Each tribe was ruled by a King, chosen by a witan, or council of elders. Invading groups set up numerous small kingdoms, and at first the various kingdoms fought frequently. As time went on, however, many of these tribal differences faded. Anglo-Saxon kingdoms traded with one another. Men married women from different tribes. Kingdoms gradually absorbed one another until seven larger ones remained. As previously mentioned, all this intermingling produced a new language. We call it Anglo-Saxon or Old English to distinguish it from our modern form. The Anglo-Saxons brought to Britain their own pagan beliefs. In the world of the 6th Century, the ever present dangers of death by accident or warfare had led these people to take a rather grim view of life. In fact, the early Anglo-Saxons believed that every human life was in the hands of fate. Their attitude was sharply different from the Christian belief in the freedom of an individual to determine his or her own path. The early Anglo-Saxons worshiped ancient Germanic gods. They included Tiu, god of war and the sky, Wodin, chief of the gods, and Fria, Woden’s wife and goddess of the home. These gods were abandoned with the coming of Christianity. Even so, their names survive in our words Tuesday, Wednesday, and Friday. In the terror of the Anglo-Saxons, the Britons retreated to the edges of their island- and beyond. Some went to the Southwestern tip (Cornwall), or the hilly western region (Wales), of Britain. Still other joined the Gaels of Ireland. This group then traveled back to Britain and settled in the northern part of the island, Scotland. In these areas, people spoke Celtic languages- Cornish, Welsh, Irish and Scottish Gaelic. All but the Cornish language can still be heard today. During the 4th Century, the Romans had accepted Christianity and introduced it to Britain. A century later, when the Celts fled the Anglo-Saxons, they took their Christian faith with them. 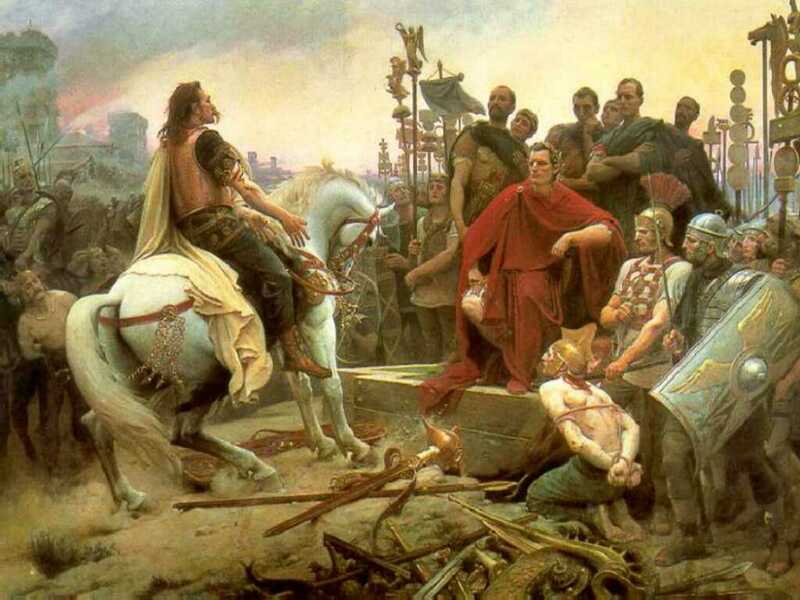 After the Rome fell to Barbarian tribes in 476 AD, the communications weakened between Celtic and Roman Christians. While the Roman Church was recovering from political chaos, the Celtic Christian Church continued the thrive. In 563, a group of Irish monks set sail in tiny skiffs for the west coast of Scotland. A Soldier and abbot named Columba, along with some monks. moved across northern Britain in the hope of winning souls for the faith. In their travels, the won acceptance among many Scots and some Anglo-Saxons. Their conversion led, in turn, to the establishment of monasteries in the north. Meanwhile, the Roman Church had reorganized itself and was beginning to send missionaries throughout Europe. in 597, the Roman Cleric Saint Augustine (not the early Christian Church father) arrived in southeast England and quickly converted King Ethelbert of Kent to Christianity. Augustine set up a monastery at Canterbury in Kent and began preaching his faith to other rulers in southern England. 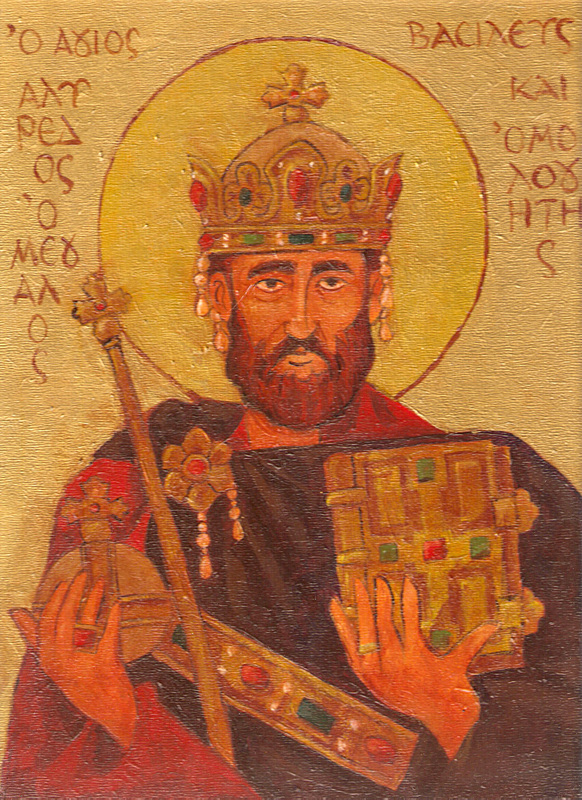 To win over a kingdom, Augustine and his followers needed only to convert the King, who would then make Christianity the religion of his realm. By the year 650, they had largely succeeded. The new religion had a profound effect on Anglo-Saxon civilization. No longer could ruling warlords indulge themselves in the belief that they had descended from pagan gods. No longer could freeman think it permissible to treat their wives or children or slaves with cruelty. Christian clerics were able to end old feuds by denouncing revenge and calling upon higher law. By providing counsel to quarreling rulers, the Church promoted peace and played a major role in unifying the English people. The Church also brought to England two elements of civilization that had been missing since the departure of the Romans: education and written literature. Christian leaders established schools at Canterbury and York and supervised the preservation of learning in the island’s monasteries. 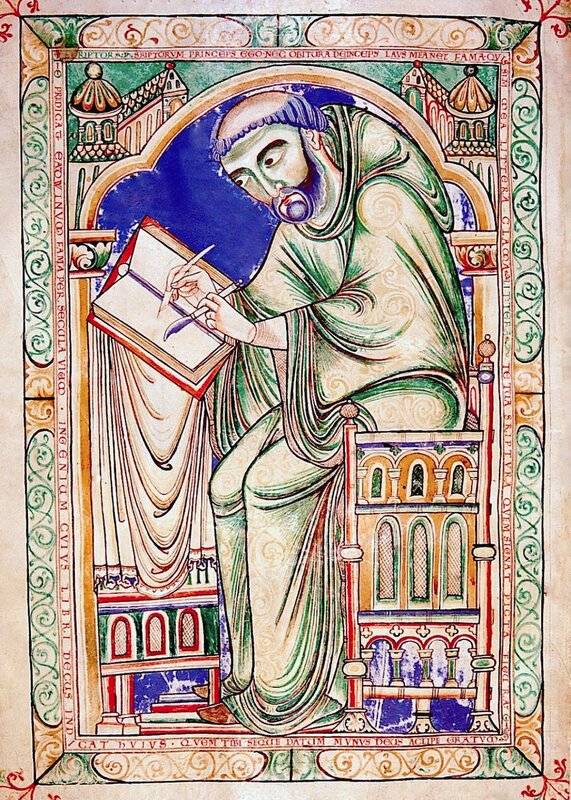 Within their secluded halls, monks often worked as scribes, recording and duplicating manuscripts, or books written by hand. At first the worked only in Latin, the language of Church scholarship. Often several monks labored for years to complete a single manuscript. These volumes were elaborately painted and illuminated in gold and silver. 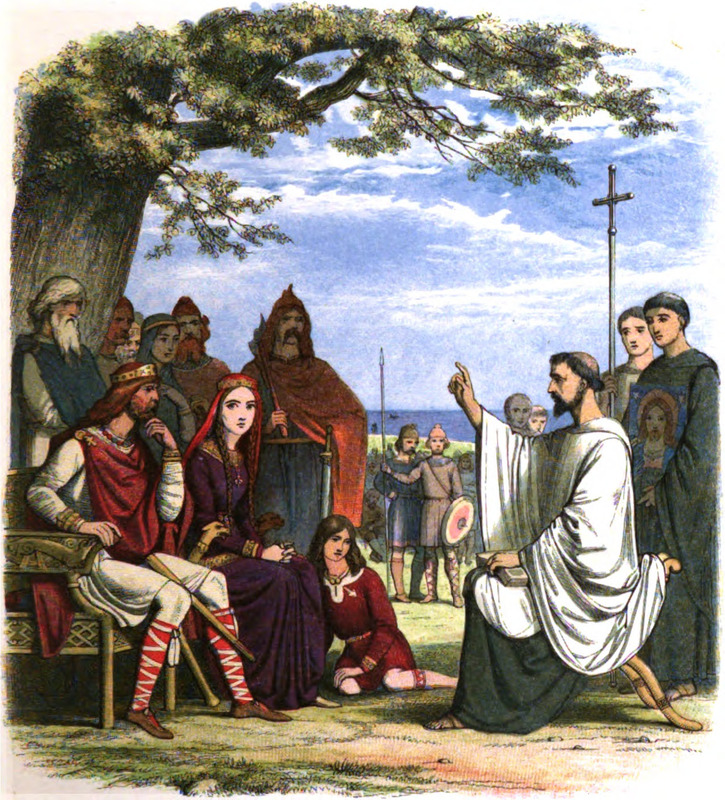 Although Christianity did indeed temper Anglo-Saxon civilization, it did not destroy the northerner’s spirit. Glimpses of an earlier world lived on in the fragments of epics such as Beowulf. 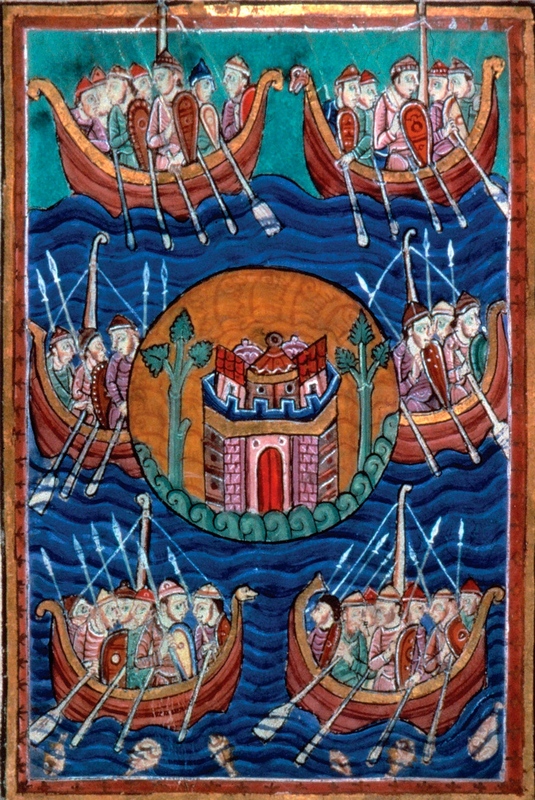 The Anglo-Saxons remained a hardy group. now they were about to come face to face with a new peril- invasion by the Vikings. Between the 9th and 12th centuries, a great restlessness overtook the region of northern Europe known as Scandinavia. 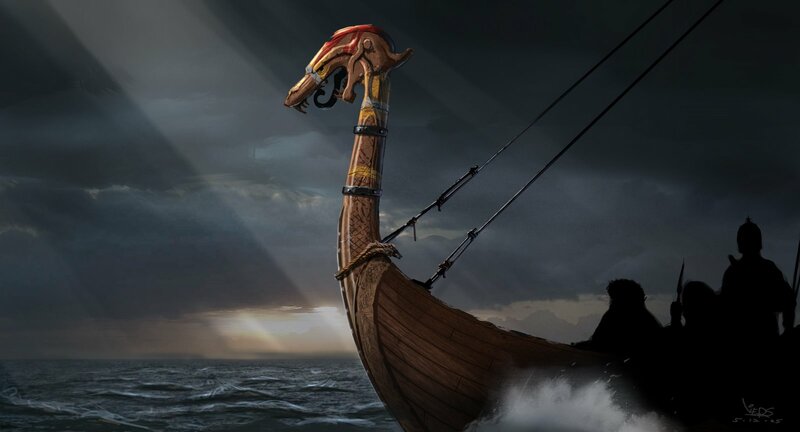 Beset with the rising population and limited farmland, the people of Norway, the Norse, and of Denmark, the Danes, took to the seas. 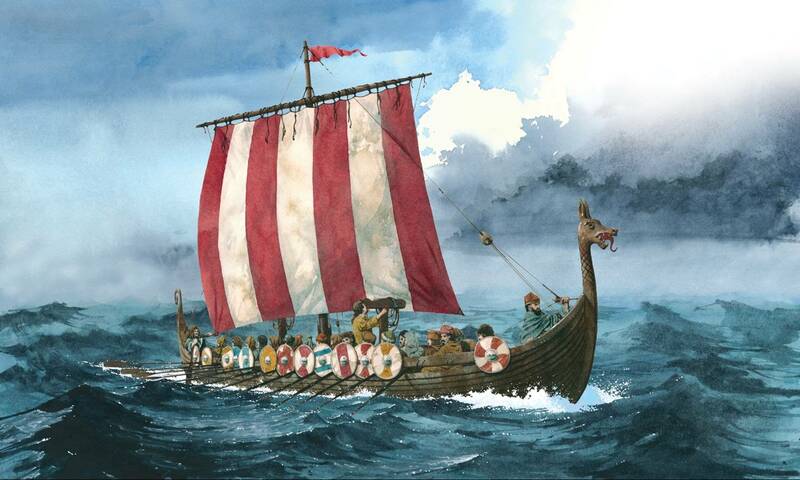 In some of their most adventurous voyages, the Vikings (warriors) carried their piracy to the British Isles. The Norse set their sights on Northumbria, Scotland, Wales, and Ireland, whereas the Danes targeted eastern and southern England. Although the English fought back valiantly, the Danes made broad inroads. By the middle of the 9th century, most of northern, eastern, and central England had fallen to the invaders. They called their territory the Danelaw. Only the Saxon kingdom of Wessex managed to fight the Danes to a standstill. In 871, a King ascended to the Wessex throne who would become the only ruler in England’s history ever to be honored with the epithet “The Great.” His name was Alfred, and he earned the title partly by resisting further Danish encroachment. Under a truce concluded in 886, England was formerly divided: the Saxons acknowledged Danish rule in the east and north, but the Danes agreed to respect Saxon rule in the south. As the king of a much expanded Wessex, Alfred the Great became a national hero. Alfred’s achievements went far beyond the field of battle, however. Not only was he instrumental in preserving the remnants of pre-Danish civilization in Britain, but he encouraged the rebirth of learning and education. To make literature and other documents more accessible, he oversaw translations of Bede’s History of the English Church and People and other works from Latin into Anglo-Saxon, the everyday language of the people. In this way he fostered the growth of the English language and its literature. He also began to keep records of English history in the Anglo Saxon Chronicle, one of our principle sources of information on early English life. Gradually the Danes became more peaceful, and old animosities subsided. Even before their arrival in England, many Danes had been accustomed to the merchant’s trade, however crudely it may have existed in northern Europe at the time. Now they built their Danelaw communities not only as military fortresses but as trading centers, and one result was the growth of English towns. Like the Anglo-Saxons, the Danes spoke a Germanic language, so they were able to communicate easily with the English. In fact, many Norse words slowly crept into the English vocabulary. The word “law” is Danish, for example. its use reflected the Dane’s interest in legal procedures. The peace and stability that began with Alfred’s reign lasted more than a century. Immigration from Scandinavia dwindled, and the descendants of Alfred the Great were able to regain much conquered territory. 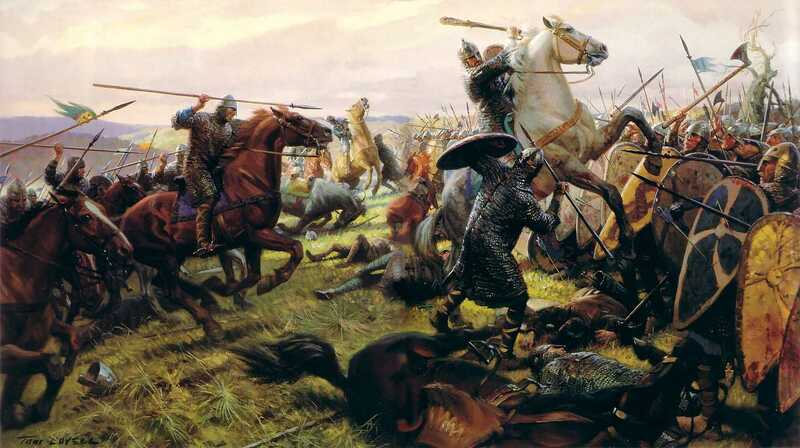 Toward the close of the 10th century, however, a new series of onslaughts began as more Danes from Europe attempted to recapture and widen the Danelaw. Once they had succeeded, they force the Saxon witan to select a succession of Danish kings. Then in 1042, the line of succession returned to the descendants of Alfred the Great. 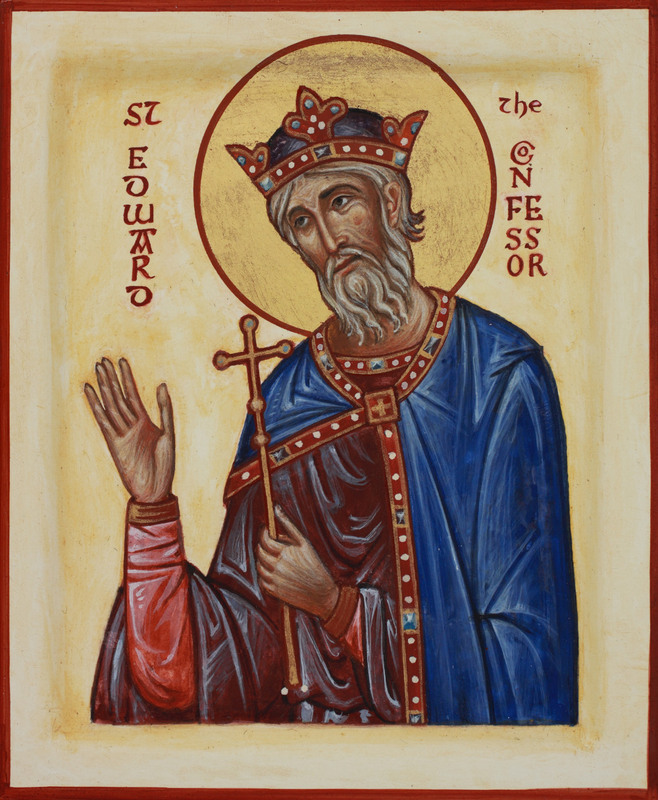 This king, Edward, had gained the title “The Confessor” because he was a deeply religious Christian. He had spent many of his years in Normandy, a region once settled by the Scandinavians and now a part of France. Norman on his mother’s side, Edward had developed a close friendship with his cousin William, Normandy’s ruler. Once Edward took the English throne, his association with the Normans further weakened Saxon power. 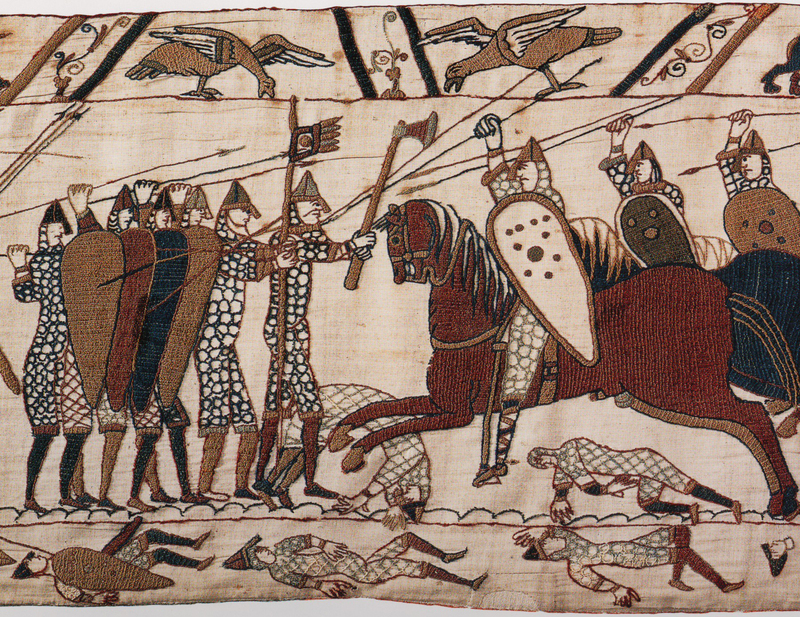 His death in 1066 led directly to the Norman conquest of England and brought to an end the Anglo Saxon period.